Latest estimates from local authorities suggest there are more than 750,000 tyres dumped around the country. Stockpiles of tyres in County Monaghan. 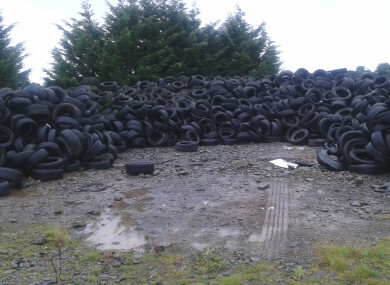 A FUND OF over €1 million is to be used to remove stockpiles of tyres that are blight on the Irish countryside, according to Minister for Communications, Climate Action and Environment Denis Naughten. This is the latest initiative by the minister to tackle waste and illegal dumping. Naughten said the problem of tyres being dumped was a problem that needed to be met head on. The funding, which will be provided to local authorities, will tackle the most significant dump sites in the country. Latest estimates from local authorities suggest there are more than 750,000 tyres dumped around Ireland. However the minister said this was a conservative estimate. “I am targeting this funding at tyres to clean up our countryside now and to ensure that the detrimental environmental and human health effects of these dumps are dealt with as soon as possible,” he said. In addition, a new compliance scheme is to be introduced to ensure that as many old tyres as possible are taken out of the system. The new scheme, which kicks in on 1 October, will reassure consumers that their old tyres will be disposed of responsibly by the retailer when they buy new tyres. “A large part of the reason for this waste problem is a lack of information in relation to the tyres market in Ireland. Therefore, I will be announcing regulations within two weeks that will introduce a full compliance scheme for tyres,” he announced. The new scheme will be run by Repak End of Life Tyres (Repak ELT) which will carry out all regulatory functions on behalf of tyre producers and tyre retailers. Naughten said membership of the scheme will be mandatory for any operator placing tyres on the Irish market. “All operators will be obliged to provide data on the numbers of tyres coming on and off the market. This will be the first time that there will be clarity in this regard,” added Naughten. Repak ELT was set up to use the money generated by new tyre levies to fund waste management and clean up the thousands of tyres stockpiled in illegal dumps, warehouses and farms across the State. Last year, tyre dealers protested outside Leinster House against the new levies. The Independent Tyre Wholesalers and Retailers Association (ITWRA) and the Irish Tyre Industry Association (ITIA) said the levies impose additional charges of upwards of €15 per tyre for hauliers. The tyre scheme is the latest announcement by the Minister in relation to illegal dumping and waste management. In June, it was announced that flat fees for waste collection are to be phased out and that brown bins will be provided in any population centre of more than 500 people. The minister said he also hopes to introduce large-scale recycling bins outside supermarkets to reduce waste at source so people who buy things in a supermarket will be able to dispose of the packaging at source. A new scheme to manage end-of-life vehicles and reduce the dumping of vehicles is soon to be announced. Naughten said he wants to make it easier for people to do the right thing and make the right choices when it comes to managing their waste. Email “'A blight on the countryside': Minister pledges money to clean up thousands of tyres dumped around Ireland”. Feedback on “'A blight on the countryside': Minister pledges money to clean up thousands of tyres dumped around Ireland”.